During these activities, young people often feel: respected, listened to, encouraged to stretch their minds and bodies, affirmed, inspired, safe, and empowered to make healthy life choices. 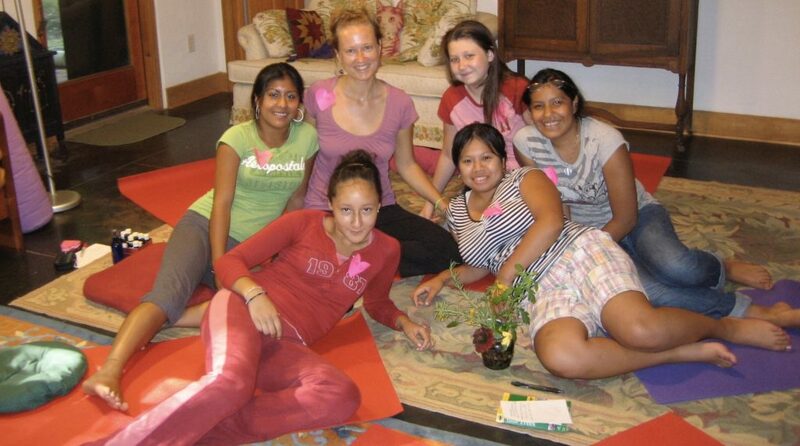 Benefits of the activities include: deep relaxation, an ability to better listen to their body’s wisdom, building courage to state needs including saying “no,” physical nourishment from healthy food and movement, self-care skills that can be used in any situation and location, hearing other youths’ stories, struggles, and successes, and feeling connected to one another and their community. All of my youth wellness educational activities incorporate my broad knowledge of healing arts modalities and self-care tools in a way that supports the needs of your school group, community organization, non-profit, or family. Whether you’re interested in resources for stress reduction, increased self-awareness, connecting with nature, or anything else you’ve seen on my website, I can create a customized workshop with a combination of activities for your group. Youth organizations I’ve been honored to partner and share with in the Triangle: Chatham Youth Development Center, Woods Charter School, Clapping Hands Farm Camps, Communities in Schools Chatham County, Raleigh Progressive School, Carolina Friends School, Auldern Academy, Carrington Middle School, Anathoth Community Garden’s Manos Abiertos Youth Program. Like many youth, I was not fully conscious of my own worth and goodness, and did not have adequate internal or external resources to navigate the trauma and turbulence of my adolescent years. Knowing what a difference it would have made for me in my adolescence, I am delighted to share with youth the empowerment and self-care skills that I have collected on my personal healing journey. I have a gift for creating a safe space in which young people of diverse cultural backgrounds, ages, body sizes and life experiences feel welcomed and affirmed. Since 1991, I have had the honor and delight of sharing, learning, and growing with youth across the country and abroad in various capacities: camp counselor, teacher, mentor, tutor, and all-around ally.